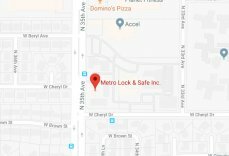 Burglar Tricks You Should Know About | Metro Lock & Safe Inc.
Posted on May 28th, 2014 by Metro Lock & Safe Inc.
For home security, you can never be too careful. Burglars and thieves will use a multitude of tricks and techniques that can help them break into your home, office, or vehicle and take your belongings. A burglar tends to target homes that are empty or otherwise unoccupied, meaning you need to be aware of the things they look for if you are planning a vacation or are absent from your home for an extended period of time. Burglars have developed a few tricks to determine whether or not people are home. By eliminating the signs of an empty house, you can work to prevent burglaries from happening to you. If you have mail and newspapers piling up in your mailbox and on your porch, a burglar will take that as a sign that the house is empty. Anything that indicates the owner has been gone for a while and has not yet returned is a sign that burglars will look for. If you are planning on being gone for an extended period of time, having your mail stopped or having a neighbor collect it for you is a good idea to avoid suspicion. If you are gone for a while, your lawn will begin to show signs of the lack of care. If you do not want your absence noticed, it could be a good idea to hire someone to care for your lawn while you are away. This could protect your home from unfortunate robberies. A burglar who is looking to target a neighborhood will watch for a few days to determine which houses are empty. Any houses that are consistently without lights at nighttime will be targeted over homes that have lights on in the evenings. To avoid being targeted, you can leave some lights on while you are away, or you can put your lights on a timer to give the appearance of being home at regular intervals. This way, the lights will go off later at night and make it seem like the residents have just gone to bed. A burglar may have ways of getting your phone number just from your last name and address. For this reason, it is advised that you do not put your last name on your mailbox. If the burglar does get your number, he or she will be listening for phone messages that indicate the owners of the home are gone. Do not leave specific messages on your machines telling people you will be gone, as your home is far more likely to be broken into if this is the case.